Hamas says two Arabs killed in weekly "March of the Return" border riots. At least 8,000 Gazan rioters demonstrated along the border fence on Friday, the IDF said. 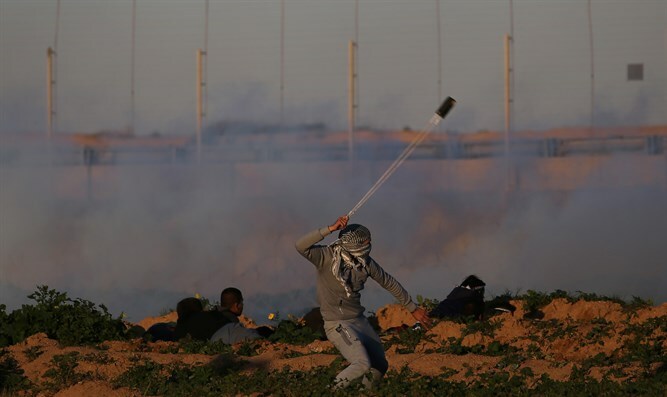 "They are hurling rocks at (Israeli) troops and towards the security fence, as well as a number of explosive devices that did not cross the fence," a spokesman told AFP, adding that they had heard grenade explosions. The Hamas-run “health ministry” in Gaza said that two Palestinian Arab teenagers were killed by Israeli troops during the clashes along the Gaza border. The IDF declined to comment on the deaths. The so-called “March of the Return” border riots have been occurring every week since March 30. The rioters gather along the fence, and throw grenades and rocks at IDF soldiers and at the fence. IDF soldiers usually respond with riot dispersal means and by firing in accordance with the rules of engagement. The protests had not been as violent as they had been when they started after Israel permitted two installments of Qatari cash into Gaza. However, the violence flared up again after Israel halted the transfer of Qatari money following an escalation in the south. The Defense Ministry announced this week that work had begun on a new barrier on the Gaza border.